This module implements a common interface to many different secure hash and message digest algorithms. Included are the FIPS secure hash algorithms SHA1, SHA224, SHA256, SHA384, and SHA512 (defined in FIPS 180-2) as well as RSA’s MD5 algorithm (defined in Internet RFC 1321). The terms “secure hash” and “message digest” are interchangeable. Older algorithms were called message digests. The modern term is secure hash. If you want the adler32 or crc32 hash functions, they are available in the zlib module. Some algorithms have known hash collision weaknesses, refer to the “See also” section at the end. There is one constructor method named for each type of hash. All return a hash object with the same simple interface. For example: use sha256() to create a SHA-256 hash object. You can now feed this object with bytes-like objects (normally bytes) using the update() method. At any point you can ask it for the digest of the concatenation of the data fed to it so far using the digest() or hexdigest() methods. For better multithreading performance, the Python GIL is released for data larger than 2047 bytes at object creation or on update. Feeding string objects into update() is not supported, as hashes work on bytes, not on characters. Constructors for hash algorithms that are always present in this module are sha1(), sha224(), sha256(), sha384(), sha512(), blake2b(), and blake2s(). md5() is normally available as well, though it may be missing if you are using a rare “FIPS compliant” build of Python. Additional algorithms may also be available depending upon the OpenSSL library that Python uses on your platform. On most platforms the sha3_224(), sha3_256(), sha3_384(), sha3_512(), shake_128(), shake_256() are also available. New in version 3.6: SHA3 (Keccak) and SHAKE constructors sha3_224(), sha3_256(), sha3_384(), sha3_512(), shake_128(), shake_256(). New in version 3.6: blake2b() and blake2s() were added. Is a generic constructor that takes the string name of the desired algorithm as its first parameter. It also exists to allow access to the above listed hashes as well as any other algorithms that your OpenSSL library may offer. The named constructors are much faster than new() and should be preferred. A set containing the names of the hash algorithms guaranteed to be supported by this module on all platforms. Note that ‘md5’ is in this list despite some upstream vendors offering an odd “FIPS compliant” Python build that excludes it. A set containing the names of the hash algorithms that are available in the running Python interpreter. These names will be recognized when passed to new(). algorithms_guaranteed will always be a subset. The same algorithm may appear multiple times in this set under different names (thanks to OpenSSL). The size of the resulting hash in bytes. The internal block size of the hash algorithm in bytes. The canonical name of this hash, always lowercase and always suitable as a parameter to new() to create another hash of this type. Changed in version 3.4: The name attribute has been present in CPython since its inception, but until Python 3.4 was not formally specified, so may not exist on some platforms. Update the hash object with the bytes-like object. Repeated calls are equivalent to a single call with the concatenation of all the arguments: m.update(a); m.update(b) is equivalent to m.update(a+b). Changed in version 3.1: The Python GIL is released to allow other threads to run while hash updates on data larger than 2047 bytes is taking place when using hash algorithms supplied by OpenSSL. Return the digest of the data passed to the update() method so far. This is a bytes object of size digest_size which may contain bytes in the whole range from 0 to 255. Like digest() except the digest is returned as a string object of double length, containing only hexadecimal digits. This may be used to exchange the value safely in email or other non-binary environments. Return a copy (“clone”) of the hash object. This can be used to efficiently compute the digests of data sharing a common initial substring. The shake_128() and shake_256() algorithms provide variable length digests with length_in_bits//2 up to 128 or 256 bits of security. As such, their digest methods require a length. Maximum length is not limited by the SHAKE algorithm. Return the digest of the data passed to the update() method so far. This is a bytes object of size length which may contain bytes in the whole range from 0 to 255. Key derivation and key stretching algorithms are designed for secure password hashing. Naive algorithms such as sha1(password) are not resistant against brute-force attacks. A good password hashing function must be tunable, slow, and include a salt. The function provides PKCS#5 password-based key derivation function 2. It uses HMAC as pseudorandom function. The string hash_name is the desired name of the hash digest algorithm for HMAC, e.g. ‘sha1’ or ‘sha256’. password and salt are interpreted as buffers of bytes. Applications and libraries should limit password to a sensible length (e.g. 1024). salt should be about 16 or more bytes from a proper source, e.g. os.urandom(). The number of iterations should be chosen based on the hash algorithm and computing power. As of 2013, at least 100,000 iterations of SHA-256 are suggested. dklen is the length of the derived key. If dklen is None then the digest size of the hash algorithm hash_name is used, e.g. 64 for SHA-512. A fast implementation of pbkdf2_hmac is available with OpenSSL. The Python implementation uses an inline version of hmac. It is about three times slower and doesn’t release the GIL. The function provides scrypt password-based key derivation function as defined in RFC 7914.
password and salt must be bytes-like objects. Applications and libraries should limit password to a sensible length (e.g. 1024). salt should be about 16 or more bytes from a proper source, e.g. os.urandom(). n is the CPU/Memory cost factor, r the block size, p parallelization factor and maxmem limits memory (OpenSSL 1.1.0 defaults to 32 MB). dklen is the length of the derived key. BLAKE2s, optimized for 8- to 32-bit platforms and produces digests of any size between 1 and 32 bytes. BLAKE2 supports keyed mode (a faster and simpler replacement for HMAC), salted hashing, personalization, and tree hashing. Hash objects from this module follow the API of standard library’s hashlib objects. data: initial chunk of data to hash, which must be bytes-like object. It can be passed only as positional argument. digest_size: size of output digest in bytes. key: key for keyed hashing (up to 64 bytes for BLAKE2b, up to 32 bytes for BLAKE2s). salt: salt for randomized hashing (up to 16 bytes for BLAKE2b, up to 8 bytes for BLAKE2s). person: personalization string (up to 16 bytes for BLAKE2b, up to 8 bytes for BLAKE2s). These sizes are available as module constants described below. 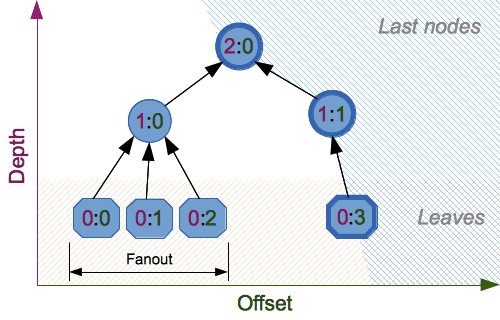 fanout: fanout (0 to 255, 0 if unlimited, 1 in sequential mode). depth: maximal depth of tree (1 to 255, 255 if unlimited, 1 in sequential mode). leaf_size: maximal byte length of leaf (0 to 2**32-1, 0 if unlimited or in sequential mode). node_offset: node offset (0 to 2**64-1 for BLAKE2b, 0 to 2**48-1 for BLAKE2s, 0 for the first, leftmost, leaf, or in sequential mode). node_depth: node depth (0 to 255, 0 for leaves, or in sequential mode). inner_size: inner digest size (0 to 64 for BLAKE2b, 0 to 32 for BLAKE2s, 0 in sequential mode). last_node: boolean indicating whether the processed node is the last one ( False for sequential mode). See section 2.10 in BLAKE2 specification for comprehensive review of tree hashing. Salt length (maximum length accepted by constructors). Personalization string length (maximum length accepted by constructors). Maximum digest size that the hash function can output. To calculate hash of some data, you should first construct a hash object by calling the appropriate constructor function (blake2b() or blake2s()), then update it with the data by calling update() on the object, and, finally, get the digest out of the object by calling digest() (or hexdigest() for hex-encoded string). Keyed hashing can be used for authentication as a faster and simpler replacement for Hash-based message authentication code (HMAC). BLAKE2 can be securely used in prefix-MAC mode thanks to the indifferentiability property inherited from BLAKE. By setting salt parameter users can introduce randomization to the hash function. Randomized hashing is useful for protecting against collision attacks on the hash function used in digital signatures. Randomized hashing is designed for situations where one party, the message preparer, generates all or part of a message to be signed by a second party, the message signer. If the message preparer is able to find cryptographic hash function collisions (i.e., two messages producing the same hash value), then they might prepare meaningful versions of the message that would produce the same hash value and digital signature, but with different results (e.g., transferring $1,000,000 to an account, rather than $10). Cryptographic hash functions have been designed with collision resistance as a major goal, but the current concentration on attacking cryptographic hash functions may result in a given cryptographic hash function providing less collision resistance than expected. Randomized hashing offers the signer additional protection by reducing the likelihood that a preparer can generate two or more messages that ultimately yield the same hash value during the digital signature generation process — even if it is practical to find collisions for the hash function. However, the use of randomized hashing may reduce the amount of security provided by a digital signature when all portions of the message are prepared by the signer. In BLAKE2 the salt is processed as a one-time input to the hash function during initialization, rather than as an input to each compression function. Salted hashing (or just hashing) with BLAKE2 or any other general-purpose cryptographic hash function, such as SHA-256, is not suitable for hashing passwords. See BLAKE2 FAQ for more information. >>> # Calculate the first hash with a random salt. >>> # Calculate the second hash with a different random salt. >>> # The digests are different. We recommend that all application designers seriously consider doing this; we have seen many protocols where a hash that is computed in one part of the protocol can be used in an entirely different part because two hash computations were done on similar or related data, and the attacker can force the application to make the hash inputs the same. Personalizing each hash function used in the protocol summarily stops this type of attack. Personalization together with the keyed mode can also be used to derive different keys from a single one. BLAKE2 was designed by Jean-Philippe Aumasson, Samuel Neves, Zooko Wilcox-O’Hearn, and Christian Winnerlein based on SHA-3 finalist BLAKE created by Jean-Philippe Aumasson, Luca Henzen, Willi Meier, and Raphael C.-W. Phan. It uses core algorithm from ChaCha cipher designed by Daniel J. Bernstein. The stdlib implementation is based on pyblake2 module. It was written by Dmitry Chestnykh based on C implementation written by Samuel Neves. The documentation was copied from pyblake2 and written by Dmitry Chestnykh. The C code was partly rewritten for Python by Christian Heimes. To the extent possible under law, the author(s) have dedicated all copyright and related and neighboring rights to this software to the public domain worldwide. This software is distributed without any warranty. You should have received a copy of the CC0 Public Domain Dedication along with this software. If not, see http://creativecommons.org/publicdomain/zero/1.0/. A module to generate message authentication codes using hashes. Another way to encode binary hashes for non-binary environments. The FIPS 180-2 publication on Secure Hash Algorithms. Wikipedia article with information on which algorithms have known issues and what that means regarding their use.